Today, every minute of every day, a child under the age of 15 dies of AIDS-related illnesses; there are approximately 15 million children AIDS orphans around the globe; and 15.5 million women are living with HIV/AIDS worldwide. This unique event will emphasize these critical HIV and AIDS issues that the concert beneficiary, CMMB, aims to address each day. HIV positive since 2000, Doreen Otieno was in and out of hospitals for a variety of ailments until she began ARVs at the Nazareth Holy Family Center in Limuru, Kenya. 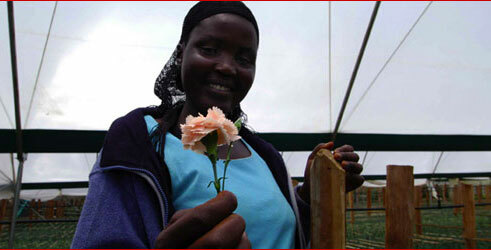 Since beginning the ARV regimen in September 2004, Otieno has been able to return to work at a nearby commercial flower farm with the same energy she had before falling ill with HIV. Doreen Otieno bends to the stems of the flowers growing in ordered rows at her feet, bathed in the even light of an outdoor greenhouse in rural Kenya. Within weeks, many of the carnations she nurtures will be on their way to flower shops across Europe, sent on their way by a woman who four years ago could not have imagined she would be alive today. "I was in and out of hospital for five years," Otieno recalled of the years that she was plagued by persistent illness. "I had pneumonia, [tuberculosis] and typhoid, and they wanted to test me for HIV." The results of that test came back positive and Otieno, then only 29, suddenly found herself among the ranks of the estimated 1.8 million Kenyans infected with the HIV virus. Over the years that followed, she continued to decline, her weight dropping and energy levels waning as the virus weakened her body. And though she heard rumors of the powerful antiretroviral medications that some in Kenya were then beginning to take, she knew they were too expensive for her to afford on her $43 monthly salary at the flower farm on which she worked. In and out of hospitals, she was unable even to afford to keep her kids in school. "I used to hear that there were some drugs that were very expensive but that if you take them they reduce the amount of virus in your body," Otieno said. "My friends who were HIV positive would wonder where those who had no money would get those drugs." The answer came sooner than she could have imagined. Stricken with meningitis in 2004, Otieno was admitted to the Nazareth Hospital in nearby Limuru, Kenya, where she remained for a week to receive treatment for the dangerous brain infection. It was there that she learned she would be able to start the ARV medications, free of charge, provided to the hospital by AIDSRelief, a U.S.-based consortium funded by the President's Emergency Plan for AIDS Relief initiative. It was a moment that was to change her life. "Someone at the hospital talked to me and told me that the doctor would decide when the time was right for me to start the ARVs," Otieno recalled. "I was told that these drugs they are giving you, you must take every day for life. You must take them at the same time every day, without changing." Now on ARVs for five months, the impact on Otieno's life has been dramatic. Though too sick to work for much of her illness, Otiono now works regular hours again at the flower farm, and has gained back 18 pounds since beginning the ARV medication. "I used to be very weak. I always wanted to be in bed, asleep," Otieno recalled. "But now I am very strong. I can even run." But the biggest impact on her life, she says, is in the lives of her children, now 14 and 10 years old. "Now, the money I used to spend on hospitals is no longer taken from my salary," Otieno said. "So now my children are back in school." Throughout her illness, Otiono said, it was always thoughts of them that kept her going, and fueled the fears she harbored about their lives without a mother to raise them. She credits AIDSRelief 's ARV medications both with keeping her two boys from joining the estimated 1.3 million children in Kenya who have lost at least one parent to AIDS, and with giving her the courage to disclose her HIV positive status to her children. "I asked them if they have seen someone who is positive, and they said yes," Otieno recalled. "And I said, 'Even your mother is positive, but I am on medication, and when you are on medication you do not die, so I will bring you up."